Everyone who grew up in the nineties of course knows ‘Rhythm is a Dancer’, a song from Snap! Today your reviewer is not going to revise this act, your local nineties party takes care of that. 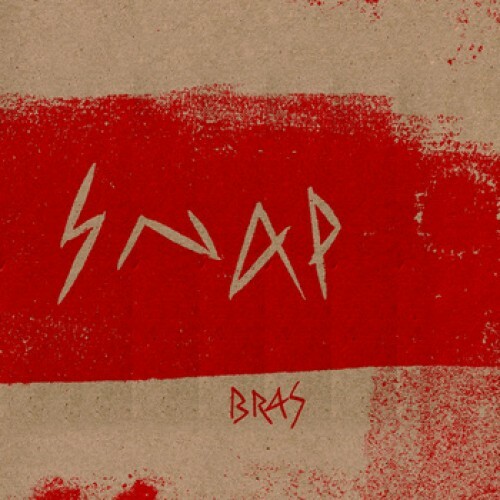 Snap is also a trio from France and created a weird EP full of experimental improvisation stuff generated from claviers and electronics combined with Post Punk. Expecting nothing and surprised completely is what Snap achieved with Bras. The Post Punk influences are not seen in the first two songs. Atypical rhythms, dissonant sounds and abrupt changing drum beats are the keywords of ‘Cocktail’, ‘Laine’ and ‘Bras’. If someone knows the Dutch duo Knalpot and I would’ve put Knalpot as band name instead of Snap you will believe immediately this is their newest record. Both acts share the same approach and don’t use vocals. During the title song things are changing. A monotonous and deformed claviers sound is put on top of an ongoing Post-Punk drum rhythm. In ‘Beat’ there is no beat found; typical experimental jazz drums are the base for random guitar picking and a droning noise. This is the least favorite song on the record because there is no direction of the song. Perhaps this is the purpose of the trio? In a typical Knalpot vibe and like playing a Nintendo computer game and don’t finish the current level ‘Only’ and the last song ‘341’ are tricking the mind of the listener. Especially when a droning sound is lasting and subtle drums are coming in again. This combination is lasting four minutes until the end and gives you time to calm down. It’s needed because the improvisation took a lot from the listener on this short EP.